BC Place, the world's largest air-supported domed stadium was opened in 1983, holds more than 60,000 seats and is covered by fabric that is 1/30 inch thick but stronger than steel. The Stadium's state-of-the-art technology goes beyond the roof. The multi-functional venue has the capability to host a variety of events, including sports, trade and consumer shows, rock concerts, royal visits and football games. BC Place is also scheduled to be the Opening and Closing Ceremonies venue for the Vancouver 2010 Winter Olympic and Paralympic Games and Medals Ceremonies. BC Place is the largest multi-use facility in British Columbia. The host to the 2010 Olympic Winter Games Opening and Closing Ceremonies and the Opening Ceremonies for the Paralympic Games, the building was conceived in 1980 to rejuvenate the False Creek area of downtown Vancouver. Built in 1983, on time and on budget at $126 million, as a worldclass, multi-purpose facility, BC Place has a capacity to seat 60,000 and can be converted to an intimate space for 7,000 in just hours. More than two decades later, BC Place continues to provide the crucial link of bringing the province's events and spectators together, while fulfilling its mandate of economic generation. The Stadium averages over 200 event days per year. Beyond the invaluable community benefit of BC Lions football and events like the Vancouver Sun Run, the amount of economic activity generated by the venue by fiscal year end 2007 was nearly $58.1million. The Stadium is also responsible for employment of 685 (FTE) persons. The top choice for business and industry for exhibition and spectator events, BC Place is host to the largest trade and consumer shows in the Province, as no other dedicated exhibition spaces exist. Although investment into and expansion of convention space will provide for a significant increase in floor space in Vancouver, BC Place remains the only venue for large public gathering and trade and consumer shows. *	BC Place is the world's largest air-supported domed stadium covering 10 acres in all, with a circumference of 760 metres (2,500 feet). *	There is enough concrete in BC Place to build a sidewalk from Vancouver to Tacoma, Washington. *	The roof is 10 acres of fibreglass woven fabric. There are two layers of fabric with a four foot space between them. *	The roof lets in 20% natural light. That's because the total thickness of each layer is only 1/30 inch (0.85 millimetres). They say we're supported by air...but we know it's the fans! The heartbeat of our building is the air-support system of the fans. It takes sixteen fans were used to inflate the roof...in less than one hour! *	It takes a work crew of approximately 15 roughly 12 - 16 hours to convert the Stadium from a consumer show to a football game. 1500 pieces off field turf stored in a moveable tray system are assembled like a jigsaw puzzle to complete the football field. *	The field turf, which was purchased from Montreal's Olympic Stadium in 2005, following the MLB Montreal Expos' move to Washington has a life expectancy of over 10 years. *	Our dressing rooms enjoy their own "wardrobe" changing for whatever celebrities they house: David Bowie converted his into a sushi bar. The Beach Boys brought in a beach complete with sand and a pool. The Rolling Stones installed a fountain. *	The facility floor has been turned into an ice rink, an Opera House and a forest. *	Features a fully-balanced public address sound system and over 200 closed circuit television monitors. *	Houses two media centres, each with a capacity of 65 and equipped with full lounge facilities. *	Ability to cater a party for up to 7,000 people. *	Circumference of 760 metres (2,500 feet). *	Largest air-supported dome in the world pressurized by 16 jet engine fans. *	First covered stadium in Canada. *	The roof is 10.25 acres of Teflon coated fiberglass consisting of 2 layers of fabric, 1/30 inch (0.85 millimetres) thick. *	20% natural light let through by the roof is enhanced by 872 metal halide fixtures using 1,500 watt flood lamps. *	Home to the 2010 Olympic Opening and Closing Ceremonies. *	Home to the 2010 Paralympic Opening Ceremonies. *	Host of nightly Victory Ceremonies for the 2010 Olympic Games. *	Mitsubishi Diamond Vision Mark III electronic videoboard. *	Allows for wide viewing angles and images of picture quality and colour to rival home television. *	Screen dimensions: 6.72 metres (22 feet) by 12.16 metres (40 feet). *	Features flat matrix cathode ray tubes with a dot density of 2,500 dots/square metre. *	Over 150 feet of LED scoreboard and advertising panels added in 2007. With big dreams, come new visions. Over the next three years BC Place will undergo a major transition to reflect its status as a world-class sporting and entertainment venue. BC Place Stadium is Canada's first domed stadium and is the largest air-supported stadium in the world. The major renovation will include two phases. Upgrades to suites, seating, washrooms, concession stands and disabled access will occur prior to the 2010 Olympic and Paralympic Winter Games. A proposed new retractable roof will be put in place after the Games. Vancouver, B.C. - The British Columbian government has approved a C$365 million plan to update BC Place with interior improvements, seismic upgrades and a retractable roof to open by the summer of 2011. It cost C$126 million (C$243 million in today's dollars) to build BC Place when it opened in 1983. The C$365 million price tag includes C$65 million in interior improvements that have already begun, a C$43 million seismic upgrade, maintenance system improvements, a contingency fund and the roof project, which is widely estimated at about C$200 million. BC Place will play host to the 2010 Olympics opening and closing ceremonies and installation of a new roof will begin after the Olympics end. 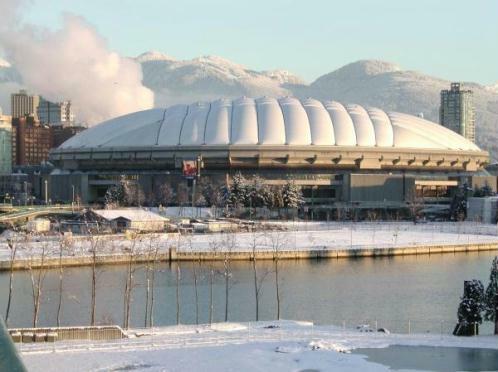 The BC Place air-supported fabric roof collapsed on Jan. 5, 2007, after heavy snow caused a large tear in one panel. A report later said staff didn't follow proper procedures to clear snow from the roof, but also said existing damage to the roof fabric and weather caused the tear. Most of the project will be financed through the development of lands near BC Place, existing cash reserves of about C$25 million, sponsorships, expanded event business and energy savings. The plan calls for more than C$100 million to be recovered through the sale and lease of development sites near the stadium. The release of the sites can be delayed until the market recovers from the recession. A final roof design is expected by the end of January, with tendering to begin by mid-February. PavCo has hired PCL Constructors to work on the next phase of the upgrade project. 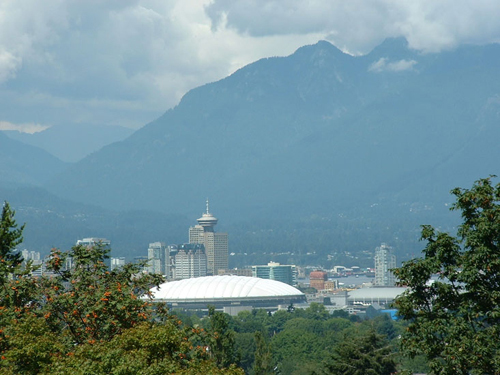 The roof project is crucial to the Vancouver Whitecaps' bid to win a Major League Soccer franchise to begin play in 2011. Six North American cities are vying for two franchises and the MLS is expected to decide on the winning bids early this year. Vancouver, B.C. - The Vancouver Whitecaps expect to thrive as a Major League Soccer team and push to become the city's number two sports franchise - behind only the market-dominant Vancouver Canucks. The team will join the league in 2011. "We will definitely be major league," said Whitecaps president Bob Lenarduzzi. "We're not trying to suggest we are the Canucks but we want to put ourselves at that level and feel that based on the league, we can. "We see MLS as the equivalent of the NHL, with teams in major markets like New York and Los Angeles and Dallas." The Whitecaps will begin MLS play in a renovated BC Place stadium in the spring of 2011, after an estimated C$365 million in upgrades have been completed - including a new retractable roof that will complement a soccer-specific design. The team will play in the stadium's lower bowl, which will seat about 20,000 fans, and target a season-ticket base of 16,500. Lenarduzzi noted Vancouver has drawn strong soccer crowds in any league it has played in, whether it was the North American Soccer league, the A-League or its current league - United Soccer Leagues. "We get 90-per-cent capacity at Swangard (Stadium) because we're a soccer city - one of the best in North America when you look at our history," he said. He said the Whitecaps have not abandoned plans to build a soccer-specific stadium on the Vancouver waterfront, although a five-year lease at BC Place will keep the team playing there until at least 2016. "The waterfront stadium is still something we'll pursue but right now, we're just focused on making a success of MLS," he said. Other cities bidding for one of two MLS franchises include Portland, St. Louis and Ottawa. Previous bid groups from Montreal, Atlanta and Miami dropped out due to economic issues and problems with the $40 million franchise fee demanded by the league during a global recession. Vancouver, B.C. - Reports say economic pressures may force the provincial government to abandon plans to build a C$365 million roof for BC Place. The government is going even further with signals that it is willing to consider a public-private partnership that could lead to a razing the stadium, renovating it, or converting it to another use, such as a convention center. A new soccer stadium, hotels and other development on the land around the venue are also on the table. Nothing is firmed up yet. But what's being considered at the top level of the government could be the largest urban land development project in Vancouver since the buildup of False Creek after Expo 86. The provincial government is also hoping that a major corporation may buy the rights to put its name on a completed stadium, whether it be BC Place or a new soccer stadium. Such a branding opportunity could be worth C$25 million or more. Construction on the downtown Vancouver stadium was expected to start soon after it serves as host for the opening and closing ceremonies of the 2010 Winter Olympics, and was part of a larger overhaul of the facility that was expected to be finished by the summer of 2011. 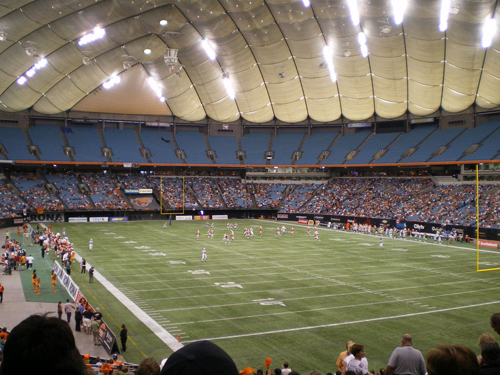 The provincial government unveiled plans in May 2008 to replace the fabric cover on the 26-year-old BC Place Stadium with a retractable roof. Officials began looking at replacing the air-supported roof after a January 2007 storm caused it to collapse into the 60,000-seat facility, flooding the field and damaging seats and luxury suites. It took crews about two weeks to re-inflate the fabric. Delays to the upgrade could also jeopardize the city's hope of landing a Major League Soccer franchise. The Vancouver Whitecaps was awarded the league's second Canadian franchise in March based on a bid that included a refurbished stadium. The retractable roof, to be modeled on a design now used in Frankfurt, Germany, is part of a redevelopment scheme for BC Place and the north shore of False Creek. It was also scheduled undergo a major facelift, starting with renovated luxury suites and improved seating, disabled access, washrooms and concession stands. The stadium is primarily used for the B.C. Lions football team, as well as for concerts and trade conventions. Two roofs are being considered for a BC Place stadium renovation being discussed in Vancouver, B.C., according to the president of the Vancouver Whitecaps, Bob Lenarduzzi. The retractable roof would be a roof within the roof so it just goes over the lower bowl, so you won't be able to see the seats in the upper bowl. The upper roof would also be retractable. The renovation is a $365 million renovation. The venue would be used for football and soccer. Vancouver, B.C. - A new C$458 million retractable roof is planned for BC Place Stadium in Vancouver. David Podmore, chairman of the Crown-owned B.C. Pavilion Corp. that runs the stadium, and Kevin Krueger, B.C. 's minister of tourism, culture and the arts, announced that it is a fixed-price contract they've signed with PCL Constructors Canada Inc.
Major construction is to begin after the 2010 Winter Olympic and Paralympic Games but Podmore said some work will start immediately. The project is scheduled for completion by summer 2011, in time for the stadium to host the Canadian Football League Grey Cup game and to welcome the new Vancouver Whitecaps Major League Soccer team. The roof project will be funded by a loan from the provincial government to be repaid out of future operating revenues, sponsorship rights and money from the sale of development rights to adjacent land near the False Creek waterfront site. Podmore said the land sale should bring in well over the initial C$100 million estimate. B.C. Place was finished in 1983 at a cost of C$126 million with a then state-of-the-art air-suspended fabric dome. Pressure to replace the roof grew after the mushroom-shaped dome ripped open and collapsed under the weight of snow in a 2007 storm. The B.C. Lions will play next season at a temporary field on the Pacific National Exhibition Grounds. If the roof isn't finished on time, the MLS Whitecaps may join them there for their initial games in 2011. Both clubs have signed long-term deals for BC Place. A 30,000 to 32,000-seat temporary stadium to house the B.C. Lions and Vancouver Whitecaps will be completed somewhere in Metro Vancouver by June 15, 2010, according to a request for proposals. It has been speculated the temporary football/soccer stadium could cost more than C$20 million. The facility is needed to give the teams a home while the C$458 million renovation of B.C. Place takes place between the end of the 2010 Olympics and the summer of 2011. The request for proposals says at least 80 percent of the seats must be on the sidelines, with at least 75 percent of those seats covered. Vancouver, B.C. - A C$500 million land development deal could provide the revenue needed for an upgrade of B.C. Place, including a C$458 million retractable roof. PavCo chairman David Podmore said the deal was "imminent". The agreement involves 700,000 square feet of development and will be a key element of the retrofit of B.C. Place, which will get its make-over after hosting the opening and closing ceremonies for the Winter Olympic Games. The provincial government announced this past October that the stadium would get a new, C$458 million retractable roof after the Games and that PavCo - the Crown corporation that runs the stadium - would pay for the job by developing nearby properties. Those properties, across False Creek from the Olympic Village, are considered the last undeveloped lands in downtown Vancouver and are in an area that the city calls False Creek North. In 2008, the city approved changes to the False Creek North Official Development Plan that cleared the way for 1.4 million feet of development capacity on the B.C. Place site and a high-density, mixed use neighborhood to focus around B.C. Place and GM Place. The B.C. Place retrofit, including upgrades that have already been completed, is budgeted at C$565 million. Once complete, the stadium will feature the largest cable-supported retractable roof in the world. Vancouver, B.C. - Renovations at BC Place will go ahead at full speed and without any last-minute budget cutting, no matter what happens to a proposed casino and entertainment complex that was supposed to help pay for it, the head of B.C. Pavilion Corp. told the Toronto Globe and Mail. Contrary to reports that the C$563 million renovation of the stadium will be imperilled if the Paragon Gaming casino project � triple the size of the current casino now in the neighborhood - doesn't go ahead, CEO Warren Buckley said, "We'll be fine. We are fully committed on all the materials so there would be no scaling back." The newspaper said many people believe that the casino development was the main financial source for the BC Place renovations, which entail replacing the old inflatable roof with a new retractable one, as well as refurbishing much of the building. But, Buckley said, the C$6 million a year that Paragon has offered to pay for a land lease was intended to cover only about C$75 million of the total cost. As well, the lease payments wouldn't even have started until 2013. The reality is that much of the stadium's renovation costs are coming from general tax dollars, the Globe and Mail reported. Of the total, he said, C$277 million was a straight capital grant from the province. Another C$40million also came from the province as compensation for maintenance that had been deferred many years on the stadium. Buckley said the C$150 million construction loan from the province is the only debt obligation the casino was going to help pay. PavCo counted on casino lease payments for about half of that. The other half of the loan payments, as well as the remaining C$100 million needed, would come from various past and future sources of money PavCo has elsewhere. It will use cash on hand, money left over from the convention-center expansion, and money from the sale of Bridge Studios, Buckley said. As well, it expects to generate new money from the enhanced stadium, including money from more days of rentals, sponsorship rights, and naming rights. Vancouver, B.C. - TELUS is finalizing a naming rights deal for the new BC Place stadium, Team Radio reported. The Vancouver-based telecom, one of the largest employers in British Columbia and a corporation regarded as one of the most philanthropic in the country, will join competitors such as Rogers Communications, Bell Canada and Videotron as leading Canadian corporations with sports venues branded with their corporate or product line names, the network said. The move would likely see the new BC Place stadium - which reopens September 30th after a C$563 million renovation and installation of a retractable roof - renamed TELUS Park or Optik Park after the telecom's fast-growing television service. Vancouver, B.C. - The company installing the steel structure for the new BC Place Stadium roof said it is facing a C$25 million cost over-run after it ran into unexpected difficulties installing the cables. Marc Dutil, chief operating officer of the Montreal-based Canam Group, said in an interview with the Vancouver Sun that installation of the cables ended up costing "several, several times" the estimated cost in order to keep the project on schedule. The company is absorbing the loss. "Vancouver is going to have the largest retractable cable-roof in the world and the largest of something always comes with new things," he said of the difficulties encountered in attaching the cables to their towers and stringing them over the stadium. He said Canam has set aside C$25 million to cover the cost over-run and that he expects there will be no impact on either the cost to B.C. taxpayers or on the scheduled Sept. 30 opening of the stadium for a B.C. Lions game. Dutil described the complexity of the cable system, held in place by towers 15 stories high, as "mind-boggling." He said the difficulty in costing the project arose over the sheer size of the job. As the size of a complex job like building a roof increases, the scale of difficulties grows exponentially. "You can look at a 3-D animation, a picture on the Web, and then you step inside and look at it and you think 'Oh my God,'" Dutil said. "There's a tremendous number of things that come with scale that were underestimated. "We've had to work overtime, we've had to bring in a lot of people. It's been a busy work site. But everybody pitched in to make sure we deliver the stadium in time." The overall contract for the retractable roof was awarded to PCL, which sub-contracted the steel fabrication and cable assembly to the Canam Group for C$120 million, the Sun reported. The Canam Group, in turn, sub-contracted the cable assembly to French company Freyssinet. Dutil said Canam is attempting to work out a plan to recover some of the losses with its sub-contractor.